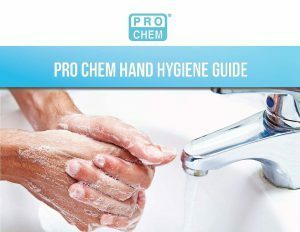 Suds Prevent | Pro Chem, Inc.
SUDS PREVENT instant hand sanitizer’s foaming bubbles spread quickly and evenly over skin, conditioning hands while killing 99.9% of common germs that cause bacteria in as little as 15 seconds, including E. coli, MRSA, and Salmonella typhi. It may be used when away from a water source or anytime you need hand sanitizing, especially when exposed to pathogens. * See efficacy data for complete listing of organisms and percent reduction in 15 seconds. Pump twice to deliver two squirts (about a quarter-size amount) of foaming product onto the palm of your hand. Rub hands together and allow to dry without wiping.